1. Anti-GABA(A) α1 Receptor (extracellular) Antibody (#AGA-001), (1:1000). 2. Anti-GABA (A) α1 Receptor (extracellular) Antibody, preincubated with the control peptide antigen. 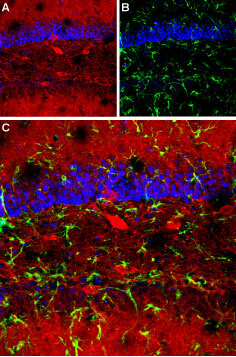 Immunohistochemical staining of mouse hippocampus using Anti-GABA(A) α1 Receptor (extracellular) Antibody (#AGA-001). A. Distribution of GABRA1 (red). B. Distribution of glial fibrillary acidic protein (green). C. Merge of the two images indicates that distribution of GABRA1 is restricted to neurons and their processes. DAPI is used as the counterstain (blue). Immunohistochemical staining of rat cerebellum using Guinea pig Anti-CaV1.2 (CACNA1C) Antibody (#AGP-001) and Anti-GABA(A) α1 Receptor (extracellular) Antibody (#AGA-001). 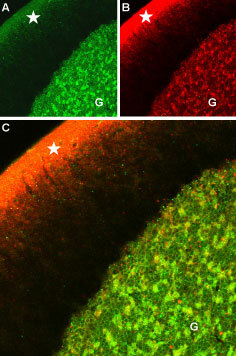 A. CaV1.2 (green) is detected in the granule layer of the cerebellum (G) and in the upper molecular layer (star). B. In the same section, GABRA1 (red) is seen in the granule layer. C. Merge of the two images reveals high degree of colocalization between CaV1.2 and GABRA1 in the granule layer. Cell surface detection of GABRA1 in intact living rat pheochromocytoma PC12 cells. A. Extracellular staining of cells using Anti-GABA(A) α1 Receptor (extracellular) Antibody (#AGA-001), (1:100) followed by goat anti-rabbit-AlexaFluor-594 secondary antibody. B. Merge image of A and live view of the cells. Rat living hippocampal neurons (1:400) (Pribiag, H. and Stellwagen, D. (2013) J. Neurosci. 33, 15879.). High resolution immuno-scanning electron microscopy (HRSEM) of GABA(A) α1 Receptor in mouse hippocampal neurons.A. BSE (backscattered electron) analysis on mouse primary hippocampal neuron cultures labeled with Anti-GABA(A) α1 Receptor (extracellular) Antibody (#AGA-001) followed by FluoroNanogoldTM Fab secondary antibody reveals the presence of GABRA1 gold clusters of variable size (due to gold-enhancement reaction) on both soma and neurites. B. 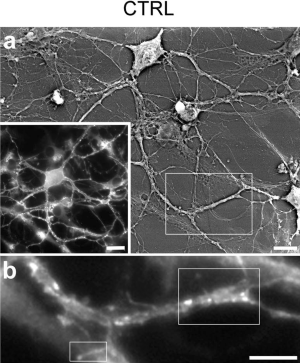 At higher magnification, gold clusters are observed on the plasma membrane in close proximity to neurite processes covering the neuron cell body. Gold clusters are also detected at contact regions between processes (synaptic contacts).Adapted from Orlando, M. et al. (2017) Sci. Rep. 7, 13768. with permission of NATURE SPRINGER. Anti-GABA(A) α1 Receptor (extracellular) Antibody (#AGA-001) is a highly specific antibody directed against an epitope of the rat protein. The antibody can be used in western blot, immunohistochemistry, and immunocytochemistry applications. The antibody recognizes an extracellular epitope and is highly suited to detect GABRA1 in live cells. It has been designed to recognize GABRA1 from human, rat, and mouse samples. Nys, J. et al. (2015) J. Neurosci. 35, 11174. Seo, S. and Leitch, B. (2014) Epilepsia 55, 224. Woo, J. et al. (2013) J. Cell Biol. 201, 929. Mouse primary hippocampus neurons (1:30). Orlando, M. et al. (2017) Sci. Rep. 7, 13768. Petrini, E.M. et al. (2014) Nat. Commun. 5, 3921. Rat living hippocampal neurons (1:400). Rat living hippocampal neurons (1:500). Chaumont, S. et al. (2013) J. Biol. Chem. 288, 28254. Burton, S.D. et al. (2017) J. Neurosci. 37, 1117. Redolfi, N. et al. (2016) Hum. Mol. Genet. 25, 5198. Ghafari, M. et al. (2017) Brain Struct. Funct. 222, 549. Seo, S. and Leitch, B. (2015) Neuroscience 306, 28. Pennacchietti, F. et al. (2017) J. Neurosci. 37, 1747. Sengupta, J.N. et al. (2013) Pain 154, 59. Yu, X. and Hou, Z.H. (2013) J. Biol. Chem. 288, 2501. Grady, M.R. et al. (2006) J. Neurosci. 26, 2841. Mangan, P.S. et al. (2005) Mol. Pharmacol. 67, 775. Sun, C. et al. (2004) Brain Res. 1029, 207. Yazulla, S. et al. (2001) J. Neurocytology. 30, 551. Anti-GABA(A) α1 Receptor (extracellular)-ATTO-488 Antibody (#AGA-001-AG). A fluorescent labeled primary antibody. It can be used in immuno-colocalization studies in conjunction with any of our antibodies raised in rabbit.